AdventureQuest is a fully Flash-animated RPG that you can play when you are on your lunchbreak, when the big game servers go down, or even for hours every day! You fight against hordes of monsters and enemies so that you can grow stronger and obtain ancient weapons of unimaginable power. You need nothing more than your web browser and the latest Macromedia Flash plugin to play. This game is in an ongoing development phase. We are always creating and adding new content to the game and updating the main game engine to improve the experience for everyone. New quests, areas, items or events show up every week in AdventureQuest! There are currently over 600 unique enemies to encounter, 400 unique weapons, over 150 unique armors and shields to use, and hundreds of spells and pets to aid you in battle, all found in dozens of quests, towns and areas through the world. As of 31 October 2007, www.battleon.com has an Alexa ranking of 927. By June 2005, the game had 5 million users, and by December 2005, 10 million. By March 2007 the game's 30 millionth user joined, and by June 2007 the game had 35 million users. By September 2007 the game had over 40 million users. As AdventureQuest grew, Artix Entertainment added new methods to pay for in-game content, such as X-Guardianship (in October 2005) and Z-Tokens (in June 2006), and released other games, such as DragonFable (on July 26, 2005), Mechquest, ArchKnight and ZardWars. Guardianship is a "premium" version of AdventureQuest, which players can buy for a one-time fee. As AdventureQuest has grown, Artix Entertainment has raised the fee several times; as of 22 October 2006, Guardianship costs $19.95, which can be paid for using credit card, PayPal, or PayByCash. Players who have bought this premium version are called "Guardians," while those playing the free version are called "Adventurers." This premium version offers players many benefits. It grants access to additional quests, events, wars and locations. Many weapons, armors, shields, pets and other items in the game are only available to Guardians. Besides starting with two health and mana potions (instead of one of each type for Adventurers), as well as being able to receive five potions at strategic points during quests from a potion bag. Guardians also have more powerful starting weapons, and can train up to level 10 in each class (instead of 5 for Adventurers). In addition, they can log in at any time, despite the server cap which limits the number of Adventurers that may play simultaneously. Players may use Z-Tokens to buy shields, armour, and weapons - these combat items, tend to be more powerful than normal items, and can be bought with a much lower, reletive level. Other things you can buy include; player-owned housing, guards for that housing, and pets which are generally more powerful than those bought with in-game gold. They may also purchase inventory slots with Z-Tokens (at the rate of 200 Z-Tokens per slot), or trade them for in-game gold. 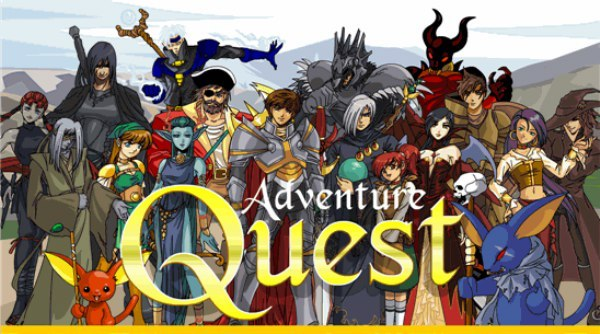 A new feature was added to AdventureQuest along with its counterpart games MechQuest and DragonFable Feb. 17, 2008. This new feature is the upgrade card. This card, which is only available at Target stores, allows a player to upgrade their character to a guardian account or purchase 3000 Z-tokens without the risk of using their Credit Card online or the long wait that the Postal Upgrade brings. This page last modified 2008-04-28 15:49:59.